Left to right: Daniela Di Lorenzo, Lauren Stein, Meir Nutman, Sharon Stein, Evelyn Nutman, Lisa Marie Browne, Giuliana Koch, Laney Lewis, Gordon Lewis, Diann Scaravilli, Maria Vittoria Rimbotti, John D. Koch, Mary Jo Zingale, Christine de Kergarious, Karen McGarry Karp, Madeleine Parker and Victor Scaravilli. The foundation Amici degli Uffizi is the official sanctioned private organization that assists in supporting the Uffizi by providing a non governmental source of funding for restoration and preservation of the unique artworks in the museum’s collection. It was founded in 1993 and the Contessa Maria Vittoria Rimbotti was one of the founding members and is the current president. In 2006 the American Friends of the Uffizi Gallery was created in Palm Beach, Florida. Contessa Maria Vittoria Rimbotti held a Florentine weekend from October 24 – October 28 2008 to welcome and honor the American donors who participated: Diann Scaravilli, Friends of the Uffizi Advisory Board Chairman with her husband Victor; Lisa Marie Browne, Executive Director; Mary Jo Zingale, Secretary; Christine de Kergariou; Daniela Di Lorenzo; Karen Karp; John Koch & Giuliana Koch Castellani; Gordon & Laney Lewis; Muir & Evelyn Nutman; Madeleine Parker; Sharon Stein & Lauren Stein, all of whom share a passion for art and Florence. The five days included a variety of art related events, visits to the Uffizi restoration projects, dinners and luncheons in historic Florence. The Marchesa Antinori welcomed us in her spectacular Palazzo, an example of 15th century civil architecture, in the heart of Renaissance Florence, near the cathedral of Santa Maria del Fiore. We had an unforgettable dinner evoking Renaissance’s splendour. The following day, we had a guided tour of the Vasari Corridor. The visit and walk began in Palazzo Vecchio and ended in the Boboli Gardens near the Buontalenti Grotto. Currently closed to the public, this is an exclusive and fascinating passageway which in ancient times connected the Palazzo Vecchio to the Palazzo Pitti. The Vasari Corridor is currently part of the Gallery and still displays a vast collection of self-portraits and many 17th and 18th century portraits as well as contemporary ones. Contessa Maria Vittoria Rimbotti held a fabulous dinner in her residence, Villa Il Garofalo. The villa’s original complex dates to the XIII Century and was firstly owned by Dante Alighieri’s family .Other illustrious families followed until the end of World War II, when Count Pier Francesco Rimbotti purchased and restored the villa to its original historical grandeur. Joining the American Friends at dinner in a magnificent frescoed dining room were the Director of the Uffizi Galleri, Mr. Antonio Natali, the Vice President of Friends of the Uffizi Gallery, Mr. Manuel Guerra, and many guests and friends of the Contessa, all of whom shared a passion for art. On Sunday, we had a tour of the Bargello National Museum guided by its Director, Mrs. Beatrice Paolozzi Strozzi. The museum is located in an important palace which was built in the mid-13th century. It houses Renaissance sculptures, including masterpieces by Donatello, Luca della Robbia, Verrocchio, Michelangelo and Cellini. During the visit, we were privileged to see the newly restored Donatello’s David, back in its original glory. Afterwards, we headed to the Tuscan hills, 30 minutes away from Florence, for lunch at Villa I Collazzi, owned by our host Marchesa Bona dei Frescobaldi. We were joined by the Marchesa’s siblings, Mrs. Mariella Marchi Pallavicino and Mr. Carlo Marchi. This is a majestic mannerist villa, whose project is attributed to Michelangelo Buonarroti. Surrounded by a splendid garden, it sits on a hilltop near Florence and overlooks the gorgeous Tuscan countryside, with its renowned vineyards and olive groves. After lunch, the Marchese Frescobaldi and his wife showed us their villa, and shared fascinating anecdotes associated with each antique. In the late afternoon, we retired to Florence and dined at “Olio & Convivium”, a casual and cozy restaurant just a few steps from Ponte Vecchio. In the morning we had a private guided tour, behind closed doors, of selected masterpieces in the Uffizi Gallery not open to the public. One of the world’s most important museums, the Uffizi was established in 1560 by Giorgio Vasari, under the commission of Cosimo I dé Medici. The Uffizi Gallery houses an immense artistic heritage that includes paintings from the Middle Ages to modern times, ancient sculptures, miniatures, tapestries and a remarkable collection of drawings and prints. Among the world renowned old master artists are: Giotto, Piero della Francesca, Botticelli, Leonardo da Vinci, Michelangelo, Raphael, Titian, and Caravaggio. During our visit, the presence of the Director of the Uffizi Gallery, Mr. Antonio Natali, made more precious our experience. After our guide showed us the museum highlights, she leaded us in the restoration rooms where several ancient statues are kept. We also had the chance to admire many pieces of art recently restored thanks to the American Friends of the Uffizi. This was yet another unforgettable occasion. 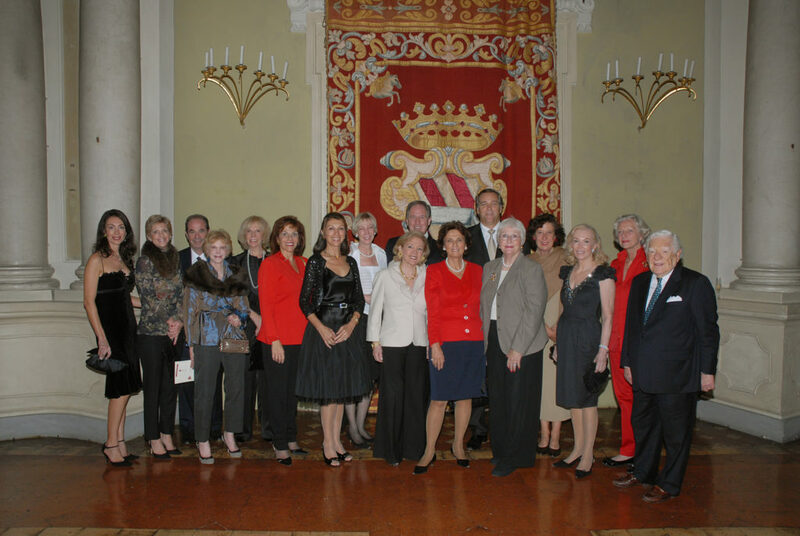 We attended a luncheon hosted by Mrs. Wanda Ferragamo at Spini Feroni Palace. Afterward we toured the Salvatore Ferragamo Museum that was opened in Florence in 1995. Located on the second floor of Palazzo Spini Feroni, the Museum extends over four rooms and comprises a collection of over ten thousand models of shoes created by Ferragamo over forty years, from the Twenties to his death in 1960. The evening culminated at the Uffizi with a classical music concert (Debussy and Schubert) in the Botticelli room. This is the museum’s most important and prestigious hall. Rarely used for events, it houses some of the most revered paintings of the Renaissance such as the world famous Botticelli “La Primavera” (“Spring”) and “La Nascita di Venere” (“The Birth of Venus”), masterpieces by Ghirlandaio, and the Portinari Triptych by Hugo van der Goes. The wonderful accompany concert was performed by the Indaco Quartet of the Fiesole School of Music. After the concert, the guests gathered at Palazzo Corsini for a dinner gala offered by Contessa Rezia Miari Corsini and Contessa Branca, both “Friends of the Uffizi Gallery”. The palazzo is located on the banks of the Arno river, in the heart of Florence , just a short walk from the Ponte Vecchio and the Duomo. The impressive main staircase leads to the Aurora Gallery where the dinner was served. Its large, arched windows look onto the courtyard and offer a splendid view of hills on the opposite side of the Arno river. The farewell gala was magical, with an unrepeatable atmosphere that evoked the magnificence of ineffable times. The last day, Mr. Sergio Giunti, President of Giunti Publishing, welcomed us at the Villa “La Loggia”, whose origins go back to 1200, today it is the headquarters of Giunti Publishing house. We attended a lecture by the eminent Leonardo scholar, Professor Paolo Galluzzi, describing a national edition of Leonardo’s complete works. Afterward, we had a light lunch in “Giuntina room” offered by Mr. Sergio Giunti. Proceeds from the Florentine weekend will go toward the restoration of particular works of art, including Renaissance paintings, tapestries and ancient marble sculptures. We look forward to similarly inspiring weeks with The American Friends and their guests.